Puts anything that could ever happen on earth, or in our solar system, to shame. "Volcanic eruptions can wreak as much havoc in space as on Earth, a new image of galaxy M87 reveals. 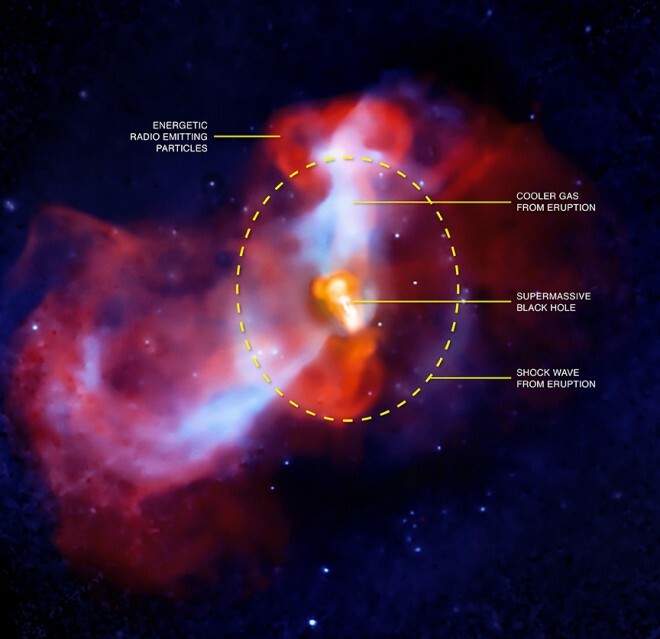 The black hole at the galaxy’s center is spewing gas and energetic particles in what researchers call a “galactic supervolcano,” and suppressing the formation of hundreds of millions of new stars. The new photo shows clouds of gas that glow in X-ray light (blue) surrounding the galaxy from observations taken by the Chandra X-ray Observatory, and jets of radio emission (red) from observations from the Very Large Array of radio telescopes in New Mexico. Under normal circumstances, the hot gas would cool and fall toward the galaxy’s center, ultimately congealing and igniting the birth of new stars. But in M87, which lies about 50 million light-years away, jets of energetic particles produced by the galaxy’s central black hole suppress the formation of new stars. The jets lift up the cooler gas near the center of the galaxy at supersonic speeds, producing shock waves in the galaxy’s atmosphere. These plumes of gas contain as much mass as all the gas within 12,000 light-years of the center of the galaxy cluster M87 belongs to. All that gas could have turned into hundreds of millions of stars if the cosmic volcano had given it a chance, researchers say."